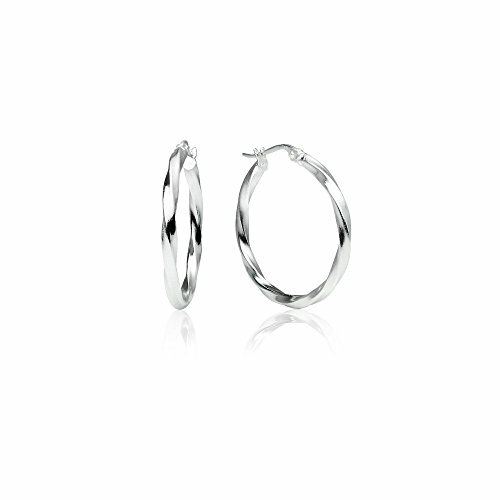 These earrings feature polished nickle free and tarnish free sterling silver high polished twist round hoops. 15mm, 20mm, 25mm, 30mm, 35mm, 40mm, 45mm, 50mm, 60mm. Earrings are 25mm in diameter, round circle twist hoop earrings. Made of 925 sterling silver, nickel free and a high polished finish with click-top closures. These are hoop earrings are suitable for women or teen girls which includes your girlfriend, wife, fiancee, mother etc. You can give these as a gift for Christmas, Valentine's Day, Mother's Day, Prom, Hanukah, Birthday's, Anniversary, Wedding or any special private occasion. Free jewelry pouch is included with your purchase. Satisfaction Guaranteed, Hassle Free Returns! If you have any questions about this product by Lovve, contact us by completing and submitting the form below. If you are looking for a specif part number, please include it with your message.